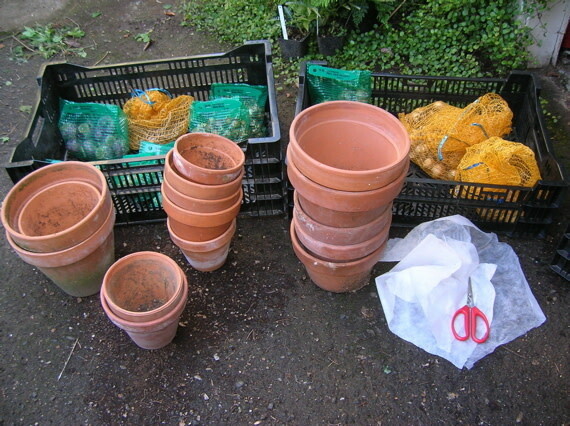 Materials all assembled: pots, potting soil, mulch, scissors, frost cloth, bulb food… and the bulbs! It’s October and that means it’s time to plant spring-flowering bulbs. Purple crocus, sunny yellow miniature daffodils (Narcissus), elegant blue iris, and other bulbs, both exotic and prosaic, can be found at retail nurseries now. (Portland Nursery has an especially wonderful selection at the moment, I noticed yesterday.) Plant bulbs now (certain kinds are best for this) and they will flower during the cold, dreary days of winter. In fact, if you plant Tete-a-Tete Narcissus in a pot in the next few days, you might even get them to flower by Christmas. They make nice gifts – and are all the sweeter when you have grown them yourself. There are some tricks to planting different kinds of bulbs. To keep it simple, start with Tete-a-Tete Narcissus. Perhaps the most popular dwarf narcissus for forcing in the world, Tete-a-Tete is reliable, cheerful and above all, early. You can use adorable little terra cotta pots from yard sales (cheap!) and, once you have your materials assembled, you can pot up a half-dozen pots in 20 minutes. If you’re feeling adventurous, try some other easy, early types of bulbs like Crocus, other dwarf Narcissus and Iris reticulata as well. -Bulbs (try other types in addition to Tete-a-Tete Narcissus if feeling adventurous!) You might start with 25 or so and plant any extras in your garden. I plant hundreds – but then again, I have zillions of little pots! Now, set up your work area. I always do it outdoors so I can make a mess. 1. Lay out your pots and estimate how many bulbs to plant per pot. 2. Cut newspaper or frost cloth squares 2-3 times the size of the drain holes and lay them over the holes to prevent soil from escaping when you water. 3. Fill the pots 1/3 full of potting soil. 4. Sprinkle fertilizer at recommended rate (by the tablespoon full for small pots) and mix it up. 5. sprinkle another handful of potting soil to separate the fertilizer from the bulbs – pots should be about 1/2 full of potting soil. 6. Gently snug bulbs onto potting soil. Don’t compact or push them hard into the soil. Their roots will need room to expand down there. I keep a tiny space between bulbs them so their roots have more room to spread out. Like most bulbs, Narcissus can be fit closely but shouldn’t touch one another. Their roots can take up a lot of space so be sure there’s enough room at the bottom of the pot for the roots to spread out. 7. Sprinkle more potting soil onto the bulbs to cover, adding more until there is about 1/2-1 inch of space left at the top of the pot. 8. 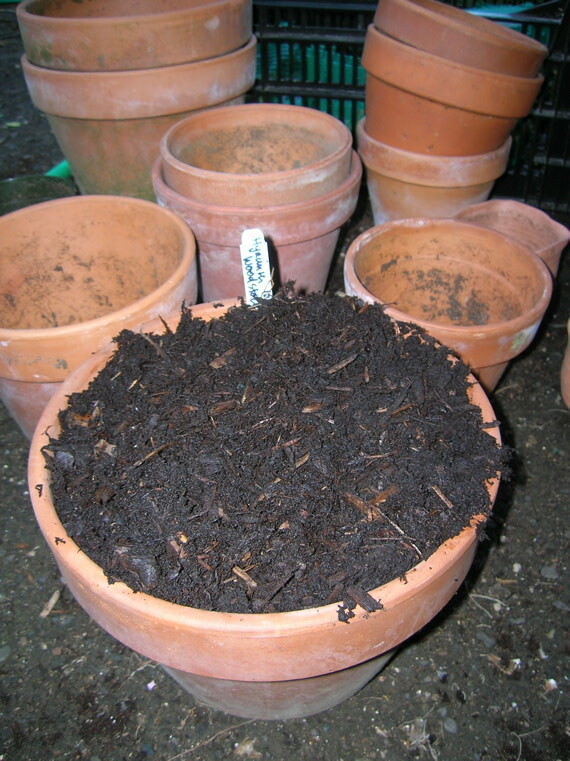 Label each pot with the bulb name, quantity, and date of planting. 9. 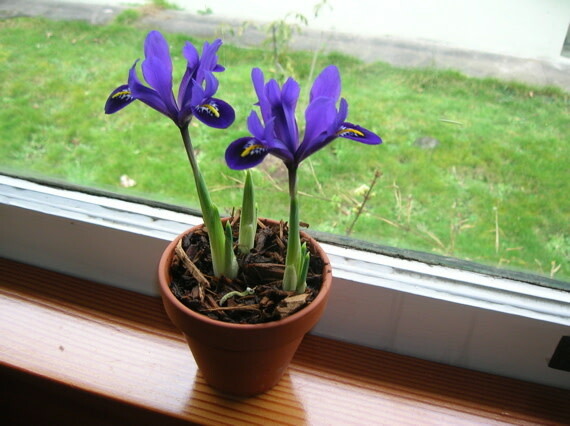 Also calculate how long a cold period each type of bulb you plant needs (ie, Tete-a-Tete Narcissus 8-10 weeks; Iris reticulata ‘Pixie’ 12-15 weeks) and mark the day on your calendar to bring them indoors. 9. Add hemlock mulch to the top of the pots. 10. Water thoroughly, until water drains out of the bottom of the pots. 11. Finally, snug the pots into a dark, shady spot outdoors where they will receive winter rain. (Remember to water them during cold, dry periods in winter.) I place my pots on the north side of an unheated shed or garage, where no sun can warm the pots all winter. Then spread hemlock mulch over the containers so that the sides of the pots are completely buried in protective mulch. This will help insulate them from frigid temperatures in their tiny pots and also help retain moisture. If squirrels are burying nuts in your pots, lay chicken wire over the top. I use fine hemlock bark to top-dress bulb pots. This helps retain moisture in the potting soil (which can tend to crust and dry out) and helps protect the bulbs from the cold winter air. 12. When the bulbs have been in cold sleep long enough (see chart below), look for small white shoots. At this point, you can scrape off some of the hemlock mulch and bring the container indoors in a cool, bright place like a drafty east windowsill (about 60F). This is where the term "forcing" comes in. By bringing the pots indoors, you are in effect tricking them into thinking it’s springtime, even when it’s cold outside. After 5-7 days, the sprouts start turning green. Move the container to a sunny window (no more than about 68F or shoots elongate and become floppy). Water daily and watch the beautiful flowers develop! Some bulbs are more easily forced than others. Easy types include Crocus chrysanthus, Muscari latifolium or Muscari ‘Valerie Finnis’, Narcissus obvallaris, Narcissus ‘Rijnvelds Early Sensation,’ Narcissus ‘Jack Snipe’, early tulips like ‘Purple Prince’, or hyacinths. 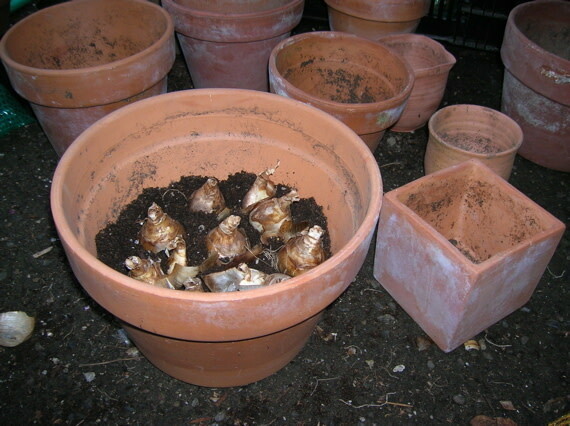 Larger bulbs are usually best in larger pots, not only because the bulbs themselves are bigger but because taller pots balance the height of taller bulbs. But play around. I like the look of small, late, black-flowered Fritillaria persica, the surreal ball-shaped Allium karataviense and pale blue Valerie Finnis Muscari. I’ve also planted a single orange parrot tulip bulb in a little terra cotta pot and it looked divine. Iris reticulata ‘Pixie’ is very early and has the loveliest rich purple color.